A multi-image collaborative work. Bangkok: Chumpon Apisuk & Kamol Phaosavasdi; Berlin: Thomas Marquard; Calgary: Myra Davies; Jerusalem: Ester Shalev & Jochen Gerz; London: Brett Turnbull; Mexico City: Guillermo Gomez-Peña & Emily Hicks. World Wide Skin Deep consists of six video viewing stations. Each station simulates a city by emitting layered fractured radio sounds and street pictures taken from that place. Out of this scatter of audio and visual stimuli, the viewer sees and hears that which he recognizes on the basis of his own personal proclivities and sensibilities. The work provides an opportunity for the viewer to explore artist's perceptions of six urban environments, one of which seems more familiar, and to discover that his fluency within his own environment has pre-equipped him, by virtue of international media communications/commonalities, to expand his range. Production funded by the Explorations Program of the Canada Council; the British Council, London; and the Siam Commercial Bank in Bangkok. Supported in Vancouver by Zenith Graphics. 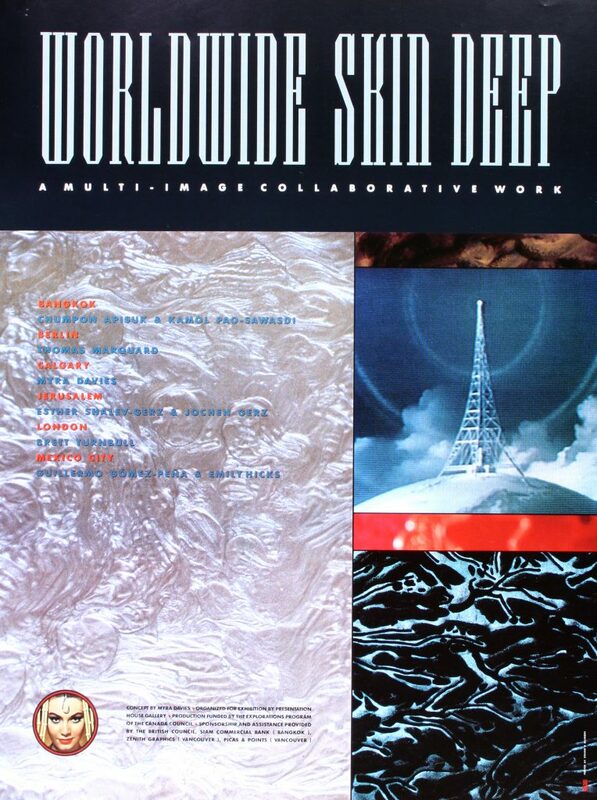 Poster for the exhibition "World Wide Skin Deep"